Address: 1016 Budapest, Hegyalja u. 14. The hotel has 23 rooms. With its romantic and inviting turn-of-the-century exterior and cosy, family atmosphere, Gold Hotel Buda is situated in the heart of Budapest. Gold Hotel Buda has a unique location at the bottom of the Gellért hill: you can walk to the Liberty Statue, to the Buda Castle and to the biggest Congress Center of Hungary. It takes couple of minutes from us to wander in the popular Váci street with the business, cultural, entertainment and tourist center of the capital. Nearby you can find the most beautiful view of the city or several thermal baths offering refreshment and recreation. You can enjoy 4 star services at discounted prices. 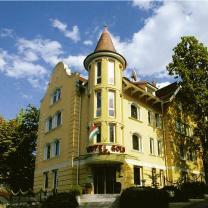 Caring, multilingual staff and our camera controlled parking secure your pleasant and safe stay in Budapest. We have renewed our rooms for you to have a more pleasant and peaceful rest and work possibilities. Nice cherrywood furnishing, parquet floor, and modern, comfortable boxspring beds are waiting for your arrival.